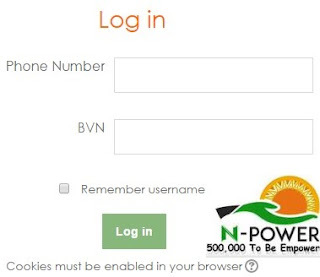 Login Npower Test Portal: First and Foremost, this is to notify the general public that the N-Power Assessment Tests has started/commenced on the 1st of July, 2017 for candidates who applied for Npower Volunteer Programme. NPOWER login Account. As a matter of fact, this news was made known on Friday afternoon through the N-power programme twitter handle, @npower_ng. According to the news update, it explained that it is an online test assessment for all applicants and that each applicants will receive an SMS a day before his/her test is scheduled. Meanwhile, the programme Cordinators further stated that it is only those whose Bank Verification Number (BVN) matches their online application, that will be contacted via text message to write the Npower test. Keep in mind that the N-Power portal reopened for registration on Tuesday​ June 13, 2017​.​ Npower Registration Forms is still available as at the time of publishing this article. Important Notice: Remember that ​​​its application, which has specific steps to be followed, ends on on July 13th 2017.